January is show season, and, as I write this, the Shooting Sportsman crew is one-third of the way through a crazy schedule. On New Year’s Day several of us left to set up our booth at the Dallas Safari Club Convention; now we are back in the office for a few days putting the finishing touches on the March/April issue while preparing for the SHOT Show, in Las Vegas. After SHOT we will return to Maine for a long weekend, then leave for the Safari Club International Convention, in Reno. Thankfully all will be done by the end of the month, and we won’t, as in years past, have to watch the Super Bowl on the Jumbotron in some casino (which is a bad thing?). Oh, the suffering we endure for the sake of the magazine . . . . The news we’re spreading at this year’s shows is all about our 25th Anniversary. Since announcing the milestone in the January/February issue, we have been overwhelmed by the positive response. In Dallas it was gratifying to be congratulated by so many readers as well as advertisers. As mentioned last time, one way we’re celebrating our anniversary is to show our appreciation to you, the reader, by giving something back. That’s why on page 50 we’re launching our 25th Anniversary Sweepstakes. Whether you’ve been subscribing to SSM since the beginning or are reading the magazine for the first time, this is a way for us to say, “Thank you,” for your interest and support. The prizes—all courtesy of our generous advertisers—are impressive, and I don’t know a wingshooter who wouldn’t be thrilled to win any of them. Of special note are the grand prizes, five in all. The first is a Woodlander over/under from Caesar Guerini. 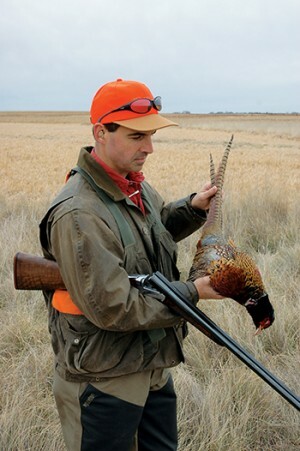 But this is no ordinary Woodlander; it is a custom gun, with double triggers and a leather-covered recoil pad. Combine that with color case hardening, an English stock and upgraded walnut, and you have the perfect gun for upland birds or clays. The second grand prize is a two-day hunt at WingHaven Lodge, in Marion, Kentucky. WingHaven is known for its stellar pointing dogs and some of the hardest-flying bobwhite quail in the South. The third grand prize is a two-day hunt at Pineridge Grouse Camp, in northern Minnesota. Pineridge is a family-run business that offers ruffed grouse and woodcock hunting on tens of thousands of acres of public and private land. The fourth grand prize is a three-day hunt at Honey Brake Lodge, in Louisiana. Known for great guides, champion retrievers and being covered up with ducks, Honey Brake boasts world-class waterfowling at one of the country’s nicest lodges. And the fifth grand prize is a two-day hunt at Cheyenne Ridge Signature Lodge, in South Dakota. First-rate guides, dogs, habitat and birds—not to mention an exceptional lodge—make Cheyenne Ridge one of the premier pheasant hunting destinations in the country. See what I mean about impressive? We’ve designed our Sweepstakes to run throughout our anniversary year, so you have until midnight December 31 to enter. All you have to do is go to the Sweepstakes page of our Website, fill out the form, and you’re in. You don’t have to buy anything. Of course, while you’re on the site it’s an excellent opportunity to subscribe, renew your subscription, give a gift or sign up for our digital magazine, Sporting Shot. We hope you agree that this is a fun way to help us celebrate and possibly score some great prizes. Also in this issue we’re announcing the next round of Readers & Writers Adventures (see p. 14). We’ve put together another exciting lineup of trips, including hunts in Oregon, South Dakota, Georgia and even Africa. If you’ve never been on one of our Adventures, you’re missing out. Not only do the destinations we choose offer excellent hunting, food and accommodations, but you’ll be spending time with like-minded sportsmen who “get it” when it comes to wingshooting & fine guns. You’ll form friendships that last a lifetime and enjoy hunting you’ll never forget. Plan like a pro: tips and tricks for the traveling wingshooter.